Born in 1983 in the town of Berezovka, in 1998 Yury Shumov entered the Lyceum in Biysk, where he studied for four years, to become “Artist-Master of Decorative and Applied Art”. At the end of the lyceum in 2002 he entered the Biysk Pedagogical University the artistic and graphic department. In addition, the same year he got a job as an art teacher at the Major Secondary School in Charyshsky District. But the prospect of teaching and long studying at the university did not inspire him. The paper and routine work interfered with self-realization and development of his own creative potential. So, in 2003 he moved to Kolyvan, to the stone-cutting plant, and worked there as a polisher of stone products. Six months later, he was engaged in bulk carving on the stone. And all this time he, along with his brothers, built a workshop in Berezovka, bought tools, manufactured machines, collected stones, and precious materials for work. By the autumn of 2008 the workshop was ready. 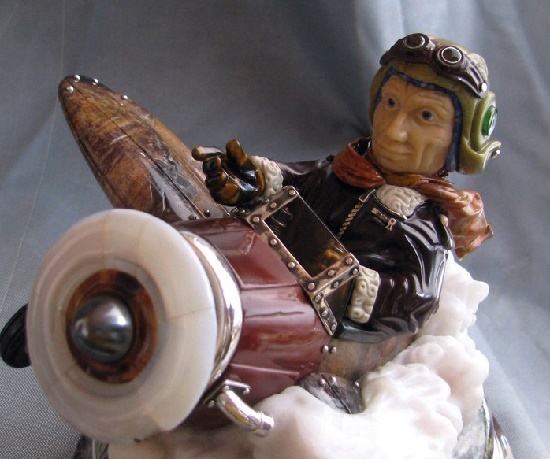 The first success came in 2010, when they won the 1st place in Charyshsky and Solonshensky district among the participants of the exhibition in the nomination “Handicraft production”. 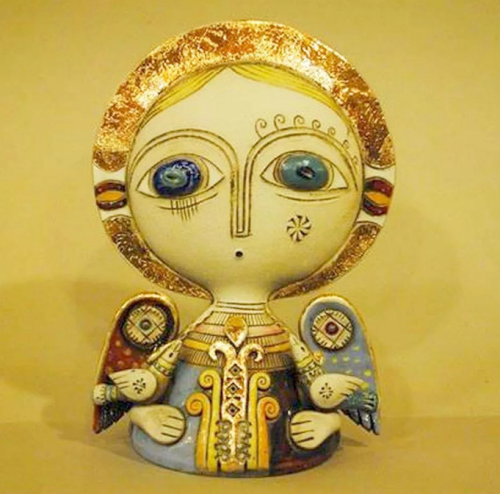 Armenian ceramic artist Aram Hunanyan has been working with clay for more than 20 years. He participates in numerous exhibitions, and his works are known not only in Armenia, but also in other countries. The master has started to do his unusual daisy angels (as well as angels with other flowers) in 2011. The image of the angel appeared not at once, gradually, step by step. And now the angels made by Aram can be recognized immediately. These figures are 10 to 40 cm high, they are all distinguished by the disproportion of the head and body, but this gives them a special charm. 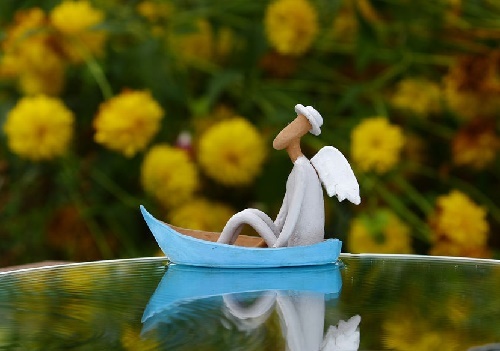 These angels are a bit naive and thoughtful, kind and loving. Meanwhile, the angels remind me of icons, and the master has pure soul and spirit, and the space around him is harmonious – a beautiful, well-groomed workshop. Among contemporary genres in jewelry and lapidary art is not so much work on the stone sculpture depicting busts or people who were historical figures concerning the recent past. Very important is the accuracy and detail of the exterior of a human immortalized in stone. Remarkable Yekaterinburg master Anatoly Ivanovich Zhukov has created the cycle of historical busts in this “rare” stone-cutting art genre. Anatoly Zhukov – Yekaterinburg artist stone-cutter and master of stone-cutting art restorer of the highest category. 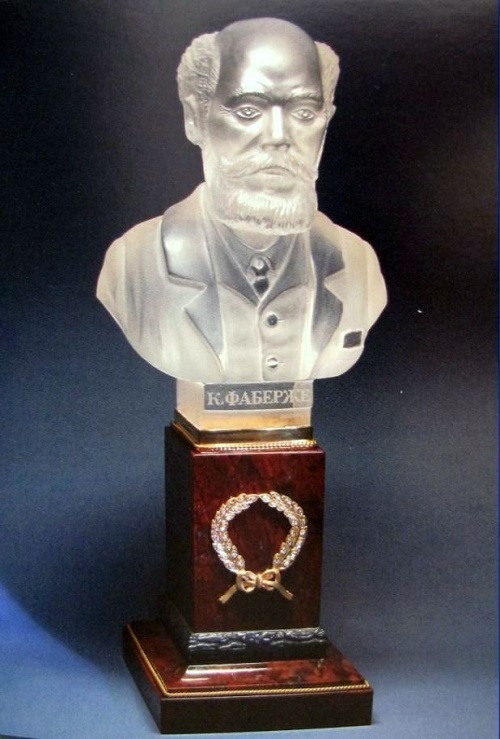 Honored lapidary artist, Commander of the Order of AK Denisov-Uralsky. Member of the Russian Artists’ Union (1995). He is one of the few jewelers who actively cuts stone, finding more and more new treatment methods and new forms. The master’s works are kept in museums in Moscow (Russian Museum of Decorative-Applied and Folk Art), St. Petersburg (Hermitage), Tyumen, Chelyabinsk, Miass, Orenburg, Krasnoyarsk, Barnaul, Sergiev Posad, Kemerovo, Khanty-Mansiysk, Yekaterinburg and the Sverdlovsk region, in foreign collections (state and private), as well as in private collections in Russia’s cultural elite, including Vladimir Putin, and Dmitry Medvedev. Russian ceramic artist and sculptor Dmitry Puchkov was born in 1969 in Moscow, where he lives to this day. Member of the International Art Fund. Although he works with other ceramic materials (fire-clay, earthenware, porcelain), still, the basic material for his works the master chose terracotta. In modern sculpture terracotta particularly used as a material for sculpture of small forms, allowing to keep in the finished product the expressive conciseness and immediacy of live sketches. 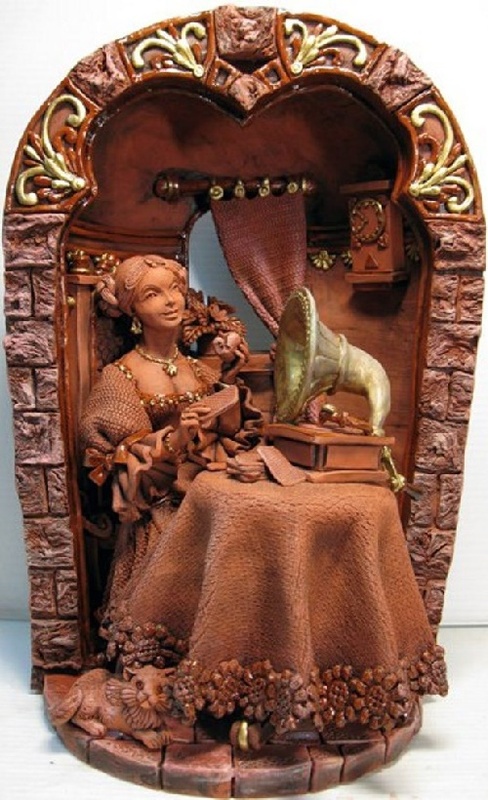 Working with terracotta, artists usually mold more conventional and less complicated sculptural forms, as the red clay is not porcelain, and much more fragile and all thin parts strive to break off from the main sculpture. Miniature bronze sculptures made by Moscow based artist of applied art Pavel Zaitsev remind of the old days of palace intrigues and magnificent balls. The bronze figures are striking in their realism and artistic performance – whether it’s French actor Jean-Paul Belmondo (1981 film “The Professional), or Mikhail Boyarsky as D’Artagnan. For more than 10 years Pavel Zaitsev has been engaged in manufacturing miniature bronze figurines as stands for wine glasses, vases, and glasses. 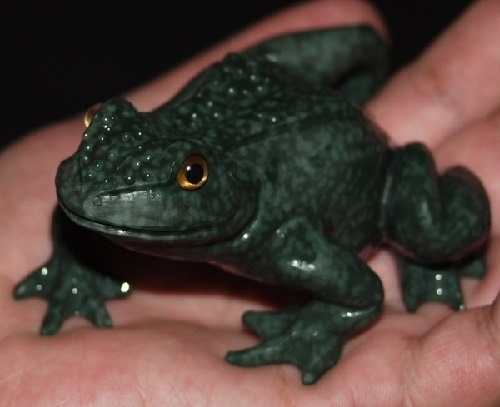 During this time he has made more than a hundred of models. The combination of bronze and cut glass (crystal) looks extremely beautiful. Master combines crystal with other metals and hot casting. These are silver and nickel silver, brass, and even gold. Made in vintage style glasses associated with palace luxury – they are sought and aristocratic, worthy of the palace interior. For Ural stone cutter Dmitry Emelyanenko it was clear even in 1981, that stone cutting art would be his way of life. He chose to enter the local college, where he could study the specialty of stone cutting art. In the early 1990s, a master stone cutter Dmitry Emelyanenko together with other artists stone cutters organized a small company – “Yakhont and Co”. Their stone cutters worked in the traditional Russian genre, and their business was one of the first in Yekaterinburg in the early 1990s. In the late 1990s, Dmitry Emelyanenko left the company and organized his own artistic stone-cutting workshop. Since that time, the master stone-cutter Dmitry Emelyanenko will execute stone-cutting work in the genre of animalism. At the same time with working in his workshop, the artist participated in various art exhibitions – regional, national and international exhibitions of art of stone carving. Dmitry Emelyanenko received numerous diplomas for creative achievement in the art of stone cutting. 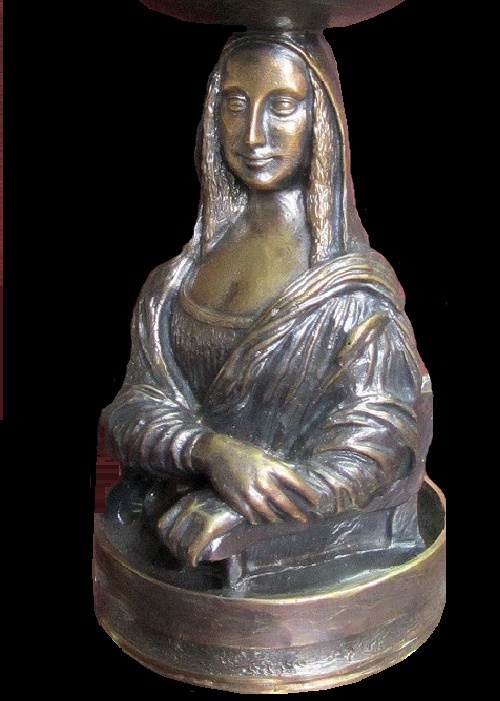 In 2010 the artist was awarded the Order of stone cutter for outstanding achievements in the preservation and development of the best traditions of the Russian stone cutting art.